In this study, we employ social network mapping techniques to analyze the shape and structure of the networked public sphere in the Arab region. 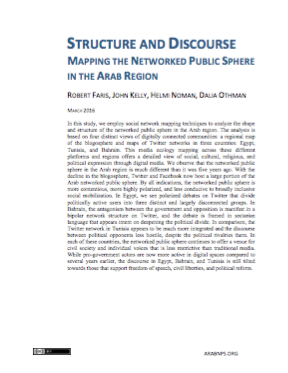 The analysis is based on four distinct views of digitally connected communities: a regional map of the blogosphere and maps of Twitter networks in three countries: Egypt, Tunisia, and Bahrain. This media ecology mapping across these different platforms and regions offers a detailed view of social, cultural, religious, and political expression through digital media. We observe that the networked public sphere in the Arab region is much different than it was five years ago. With the decline in the blogosphere, Twitter and Facebook now host a large portion of the Arab networked public sphere. By all indications, the networked public sphere is more contentious, more highly polarized, and less conducive to broadly inclusive social mobilization. In Egypt, we see polarized debates on Twitter that divide politically active users into three distinct and largely disconnected groups. In Bahrain, the antagonism between the government and opposition is manifest in a bipolar network structure on Twitter, and the debate is framed in sectarian language that appears intent on deepening the political divide. In comparison, the Twitter network in Tunisia appears to be much more integrated and the discourse between political opponents less hostile, despite the political rivalries there. In each of these countries, the networked public sphere continues to offer a venue for civil society and individual voices that is less restrictive than traditional media. While pro-government actors are now more active in digital spaces compared to several years earlier, the discourse in Egypt, Bahrain, and Tunisia is still tilted towards those that support freedom of speech, civil liberties, and political reform.